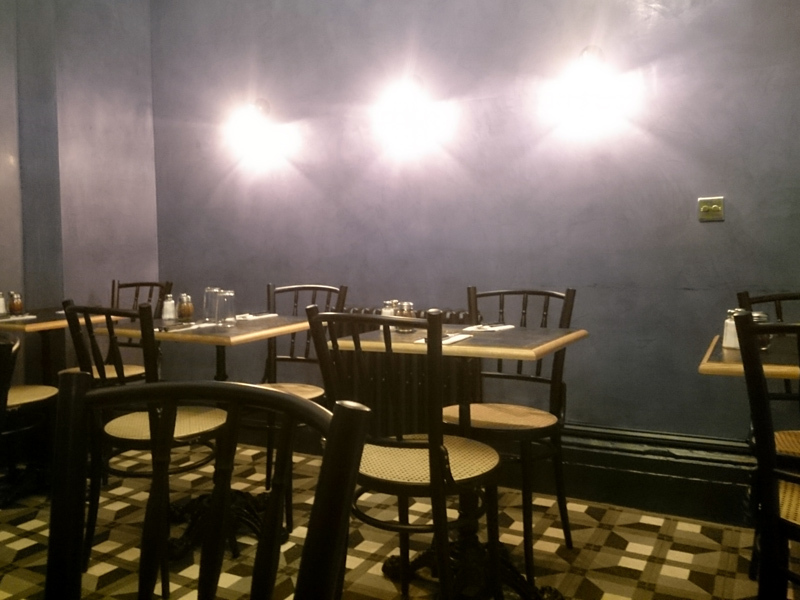 Fatto a Mano have had a huge success so far in Brighton after opening their first branch on London Road. And deserve it they do. 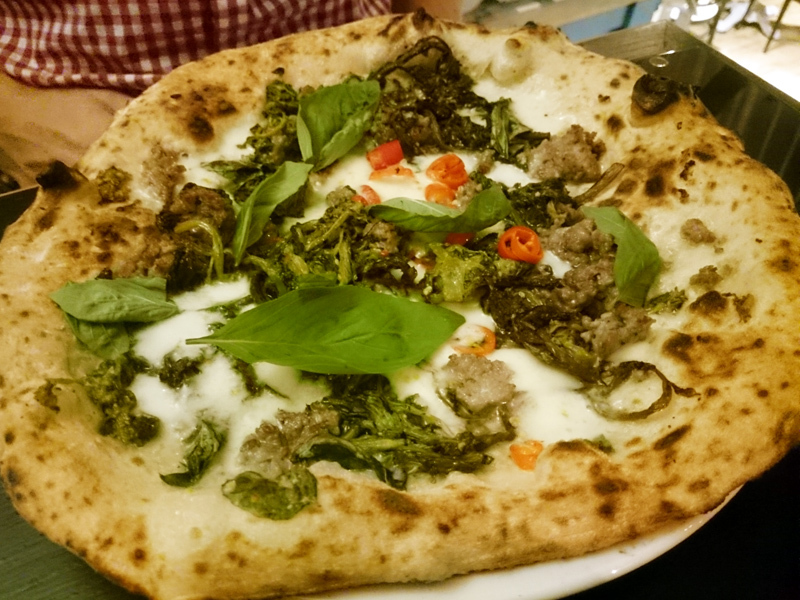 They brought authentic, Neapolitan pizza to Brighton when we were starved of the real deal. Although we are now lucky to have a small selection of excellent pizzerias, they still hold their own in the top three. The premises at Hove are larger and I a fan of the interior. Whereas London Road is simple, bright and intimate, Hove has deeper tones and, indulge me for a second, the dreamy colour of the year - Hague Blue. The kerb side terrace in the summer no doubt will be full of clinking Prosecco glasses and chatter. Their imposing wood-fired oven is there centre stage where you can choose a table to enjoy the theatre of pizza creation as you dine. It never gets old. Typically I have a personal rule not to have a starter when at a pizzeria. For some reason this went out of the window and I chose the special menu with the Tronchetto. This arrived as an enormous rolled pizza dough stuffed with Brighton Blue cheese and wrapped with good quality Parma Ham. As a lunch this would hit the spot beautifully and it was delicious with that melting cheese centre, but as a starter was far too large for one person. And, because I like being right, my rule still stands as it took the edge of the enjoyment of my pizza. 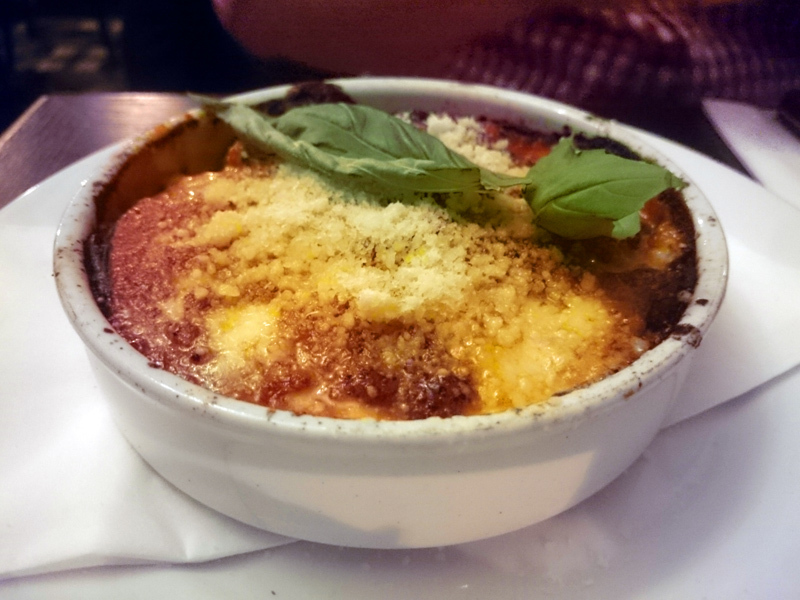 Mr GF, who has been a part of the family for a good 18 years, decided to take life into his own hands and chose the Melanzane Parmigiana to "see if it was better than his Mother-in Law's". Now my Italian mamma makes a mean Melanzane Parmigiana, but regional Italian food being what it is, hers is sandwiches of aubergine slices stuffed with cheese, lightly battered and fried before soaking up a rich tomato sauce. Honestly, and with my inheritance in mind I would say they were different and both glorious to eat. 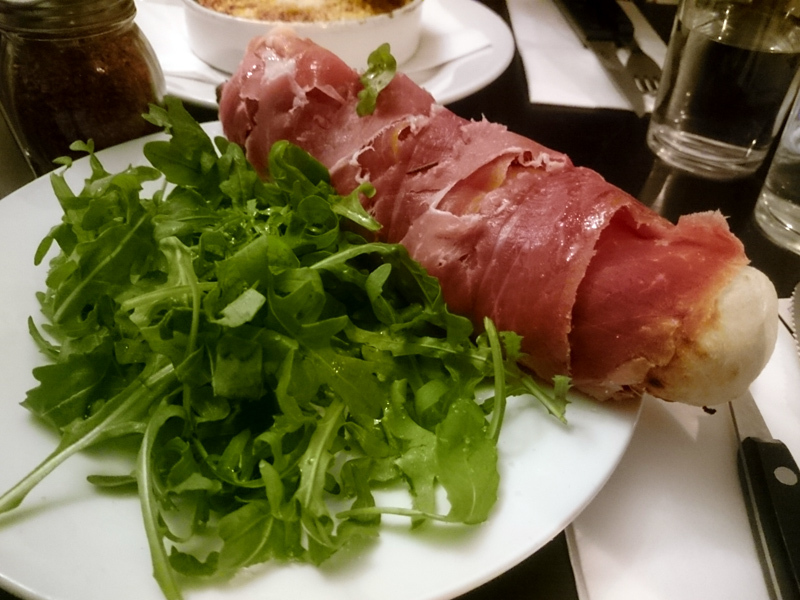 Again, I would happily return for this dish as part of a lunch. Cooked in the ceramic dish, it was vibrant and succulent, the thin layers of aubergine giving a beautiful squish rather than sogginess in the well-seasoned tomato sauce. They also offer chips as a starter too which is beyond my understanding. But lots of people order them so there you go. 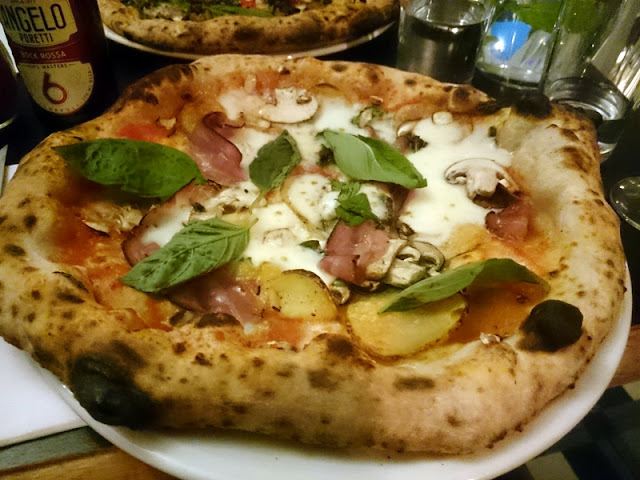 Fatto offer the perfect number of pizzas on the menu. Not too many, but enough of a choice, split into red sauce bases and "white" versions without. I chose the Sussex Pancetta, mushroom, potato, mozzarella, parmesan and sage. The dough was as I would expect from Fatto. Pillow soft crust with a slight chew, thin and tasty as it comes from the char of the oven. Just look at that leaoparding (the black blisters) and underskirt (base char) - perfect. I like how they honour local produce in a lot of what they offer and the selection of toppings here were just right. For me, pizza is about the base first, then the toppings, so I normally go very simple with Margarita or a Napoletana to enjoy the dough, but aside from a dulled appetite, I polished of the majority. Mr GF went for the salsiccia and friarielli, a broccoli-hybrid not commonly found in the UK which to me, is the ideal partnership with that fennel seed rich sausage. I love a little heat on pizza too so the healthy sprinkling of fresh chilli was welcome. I like to end my pizza meals as simply as possible so a scoop of gelato or an affogato and a digestivo does the trick. They offer a small selection of desserts including the scugnizzielli, Italy's answer to churros, but a trio of dough for a meal is too much even for this carb, loving gal. Although I enjoyed my meal, I think I ever so slightly preferred my visits to Brighton. Maybe it was the Hove air (it takes a LOT for me to cross that Palmeira border! ), but the nature of fresh dough is that it's going to be different in the hands of different people on different days. Saying that, the people of Hove should be beside themselves that they now have this gem on their doorstep. You can be guaranteed of a great meal here that won't break the bank. Staff are great. Quick (as every pizzeria should be), efficient and friendly. This is very much a perfect neighbourhood restaurant. I was invited to the launch of Fatto a Mano Hove. Words and thoughts, as always, are my own.